TargetWoman is a portal dedicated to Women - Pages of lasting value on issues women care about. Statistics reveal that not less than 100,000 babies suffer from milk allergy every year in the US. Infants with milk allergy are extremely fussy due to an allergy in cow's milk which is the basis for most commercial formulas. There are instances when even infants who are exclusively breast fed can exhibit signs and symptoms of food allergy. The toddler exhibits a bloated stomach and suffers from chronic or constant gas, spits up frequently and cries incessantly. Some infants vomit after eating. Stools may be less frequent leading to constipation. For some, it may be extremely watery and loose and of the wrong color for a breast-fed baby. Diarrhea is common in babies but if there is blood in the stools it could signal a serious allergy to milk. As indicated earlier, vomiting beyond typical mealtime regurgitation should be examined by a doctor. There occurs a possible skin rash due to milk allergy. Babies become extremely fussy and cry continuously and inconsolably for long duration of time. Gastrointestinal pain resulting from allergy to proteins found in milk may be the reason for the fussiness and crying. Low or no weight gain may be due to milk allergy due to excessive diarrhea and vomiting. Although all babies have gas, this can be another signal to allergy of milk proteins. Wheezing, struggling to breathe and excess mucus in the nose and throat may be due to baby's reaction to protein found in milk. Dehydration, loss of appetite and lack of energy may be due to milk allergy. The infant lacks proper nutrition and there is a failure to thrive. Under such circumstances, it would be better to talk to the medical doctor about testing and alternatives of milk based formulas and dairy products. Why does milk allergy occur? Many protein allergens in milk can cause allergic reactions; Casein and whey are the two main components in milk. While curd that forms when milk is left to sour is called casein, the watery part which is left when the curd is removed is called whey. Casein accounts for at least 80% of protein in milk and the other allergen found is cheese. Whey accounts for the other 20% of milk. This consists of two main allergenic proteins - alpha lactalbumin and beta lactaglobulin. When the immune system of the infant mistakes milk protein for something that the body should fight off, a milk allergy occurs. The allergic reaction that results can cause an infant to be fussy and irritable. It can upset the stomach. However, infants who are breast feed have a much lower risk of developing a milk allergy than those who use formula feed. Typically, such milk allergies go away in the natural process when the child is between 3 and 5 years of age. There are instances when some kids never outgrow it. The toddler can be reintroduced to cow's milk on the advice of the allergist. In cases where the infant has outgrown the milk allergy, it can be introduced under close medical supervision. Toddlers suffering milk allergy must also avoid cheese, yogurt, ice-cream and cereals that contain powdered cow's milk. Butter and buttermilk is also not recommended for kids suffering milk allergy. Replacements that can be considered are almond milk, oat milk, soy milk and rice milk. To ensure that the child is not suffering any nutritional deficiency, you can supplement with	fruit juices and tofu. Many construe that a milk allergy is the same of lactose intolerance but it is not so. The inability to digest the sugar lactose, which is quite rare in infants and more common among older kids and adults, is termed lactose intolerance. Whereas, allergy to milk indicates a reaction to the protein in milk. This is common in infants and children. Breastfeeding is vital for an infant with allergies. In fact, breastfeeding is the best chance to outgrow the allergies and prevent others in toddlers and infants. The concept here is that the more strictly the offending allergen is avoided, the more likely the child will outgrow the allergy. If the baby is allergic to milk but not soy, the parent can use the soy formula. The label has to be read carefully for any whey or casein or other milk names. And it should be well remembered that about 30 - 50% of babies with milk allergy also develop soy allergy. 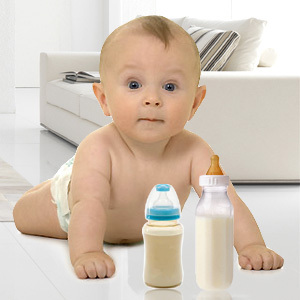 Most of the times, infant milk allergy is treated either by eliminating the milk proteins from the nursing mother's diet or by replacing with an amino acid based formula instead of the regular formula. First Published Date: 14 May 2010 Last modified Date: April 22 2019 This page may have been updated recently as new information is available or the content may have been edited for better readability.